Wyatt Earp Vendetta Ride, October 11. This five-day historic ride shadows Wyatt Earp and his posse’s bloody trail of revenge against the Cowboy faction after the assassination of Morgan Earp. We’ll travel to the Chiricahua, Dragoon and Whetstone Mountains, through the high country surrounding Tombstone. We’ll ride to the controversial site where Wyatt killed Curly Bill in a deadly, gun-blazin’ spew of lead – where only a few historians have visited; we’ll visit Johnny Ringo’s gravesite – was it a suicide as reported or did Wyatt and Doc return for their final Vendetta coup-de-grace? We’ll ride to the ghost town of Fairbank – where the Cowboys once reigned supreme; we’ll meet our Apache historians at the Cochise Stronghold and learn their history; and we’ll ride down Allen Street – one of the deadliest streets in Old West history. Horses, tack, food, wranglers, historians, and more provided. Join us as we ride Wyatt’s Trail of Retribution Visit: www.Great-American-Adventures.com for complete details or call 505-286-4585 to book your saddle now. MPVA 2015 Bankhead Highway Convoy of Historic Vehicles on October 13, until 5:00 PM. Come out to see, touch, admire, and photograph historic vehicles as they retrace the route taken by the 1920 Transcontinental Motor Convoy, traveling from Washington DC to San Diego, CA via the Bankhead Highway. Additionally, the Convoy participants shall use this opportunity to say ‘thank you’ to all the military Veterans, active-duty armed forces personnel and their families for their service to our Country. Finally the Convoy participants shall present their HMVs during daily static shows to educate the public on the importance of their HMV during its military service life. Helldorado Days October 16 – 18, is a festival that began in Tombstone in 1929 and is held every year in October. Check out the most rip-roaring celebration in Tombstone during Helldorado Days! Helldorado is held every third weekend in October and consists of gunfight re-enactment shows, street entertainment, fashion shows and a family oriented carnival. In addition, come and watch the Annual Helldorado Parade on Sunday at 11am. Border Town October 21 – 25 8:00AM to 5:00PM is a multiple week event, Border Town Cowboy Action Shooting Arizona State Championship, comes to an end here in Tombstone, and there will be plenty of activities to enjoy – including shopping and food vendors to accommodate the public coming to watch the show! For more information visit www.bordertowncas.com See Who’s Coming To Border Town (flyer attached). 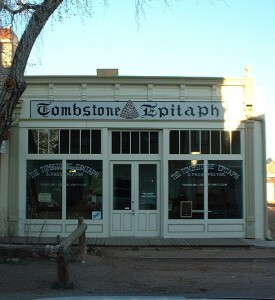 And the ever popular Tombstone at Twilight October 24 5:00 – 8:00 PM When the town stays open later in the night. There will be shopping, dining, entertainment and a free evening gunfight by Blood at Dusk Gunfighters. There will also be raffles done throughout the night. Walk along the wood board walk with the old gas lamp lighting your way. Keep an eye on the Chamber website www.tombstonechamber.com for updates on these events and others that might arise between now and the end of October. Hope to see you this fall Down by the River…. Posted in Events and Things To Do | Comments Off on Autumn at Down by the River!